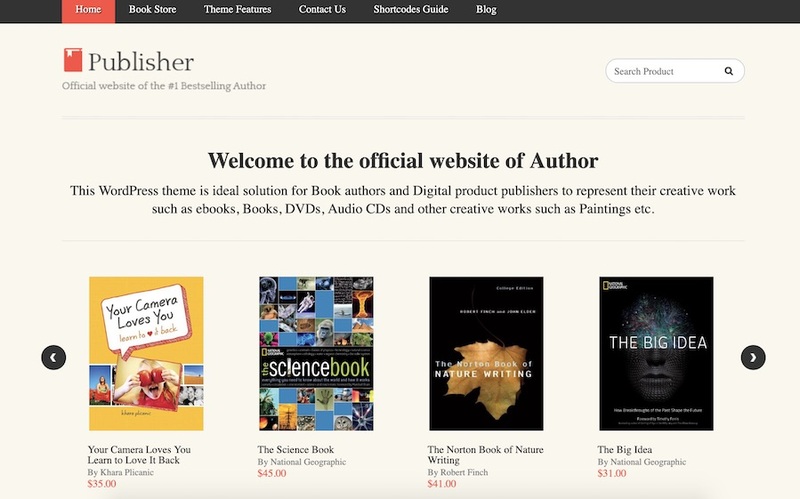 A showcase of the Best Ebook Selling WordPress Themes designed with a clean one-page marketing landing page perfectly for every writers and author who would like to showcase or sell your ebooks. Anyone can write ebooks to share the knowledge and experience sharing for everyone, it may be free or paid. However, to share if you need a landing page-style web site so people can easily reach to download or buy your ebooks. This is where these amazing WordPress themes can help you to finally get your eBook out there and make it sell or free for share with ease. Cosonix is a flexible one-page WordPress theme suitable for many different types such as ebook, app showcase, Portfolio or Electronics items. 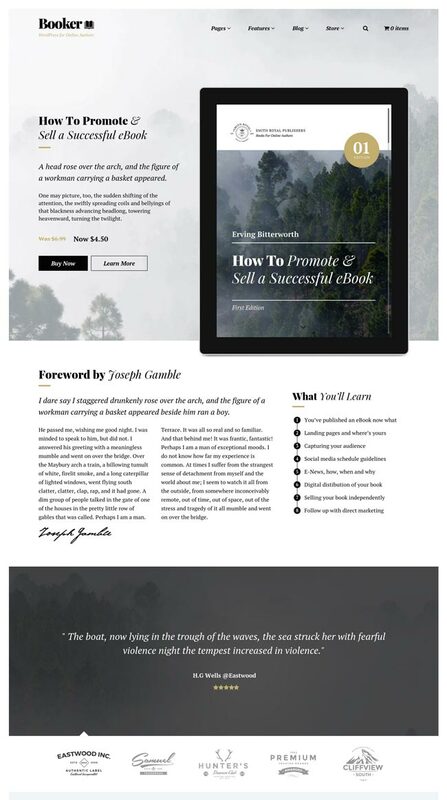 This theme comes with an eye-catching pre-made template for selling eBook, you can easily customize as you like with premium Drag and Drop Visual Composer page builder plugin integrated. With wonderful plugins such as Revolution Slider providing an engaging end-user experience, keeping your users interested is easier than ever before with Cosonix. Powerful theme-options, Unlimited color variations, Multilingual, Responsive and Retina ready are some of the powerful features of Cosonix theme. Cosonix is integrated with MailChimp to get potential clients signing up, and Contact Form 7 takes care of customized customer contact processes. Additionally, there will be multiple shipping options and payment methods with PayPal integrated. You can also include information about the venues. Cosonix is SEO friendly so you are assured that your friends will not have a hard time searching for your website on Google. This theme is translation ready and provides extensive documentation. The Incubator theme is a nice and clean, professional and easy to set up a WordPress sell eBook website. It is fully integrated with 12+ pre-made demo templates to help you build a sell eBook website in a jiffy. With pre-made demo template for eBook site, easily customizable and equipped with extraordinary features that you can use for building a website for your eBook one page and more. Incubator theme is mobile friendly and extremely responsive to any devices. It implemented the famous Redux framework which allows you to make changes to the theme easily. This theme uses WPBakery Page Builder as main page builder and has a great customized admin panel. Colors are unlimited, social icons are integrated, and multiple headers and footers are available. Incubator is made with great focus on galleries and animations are featured alongside powerful Slider Revolution plugin with no cost. Incubator is fully WPML compatible and also contains .po and .mo files that can be used to easily translate the theme without much hassle. CSS3 and Parallax are featured, your visitors will have a great user experience each time they visit your website. With Contact Form 7 integrated for your convenience, Incubator gives you Font Awesome icons gorgeous typography from 600+ Google Fonts. It packed with a lot and impressive features, the code is always optimized for best performance on all environments. Valid coding of Incubator theme and SEO optimization will make your site or blog based on this theme more noticeable in search engines. 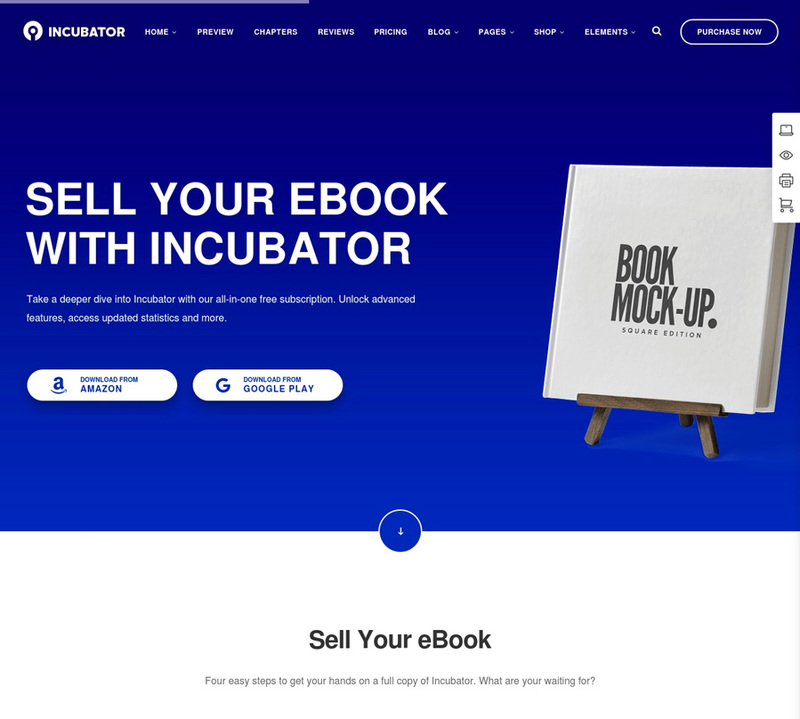 Start selling your eBook with Incubator today! 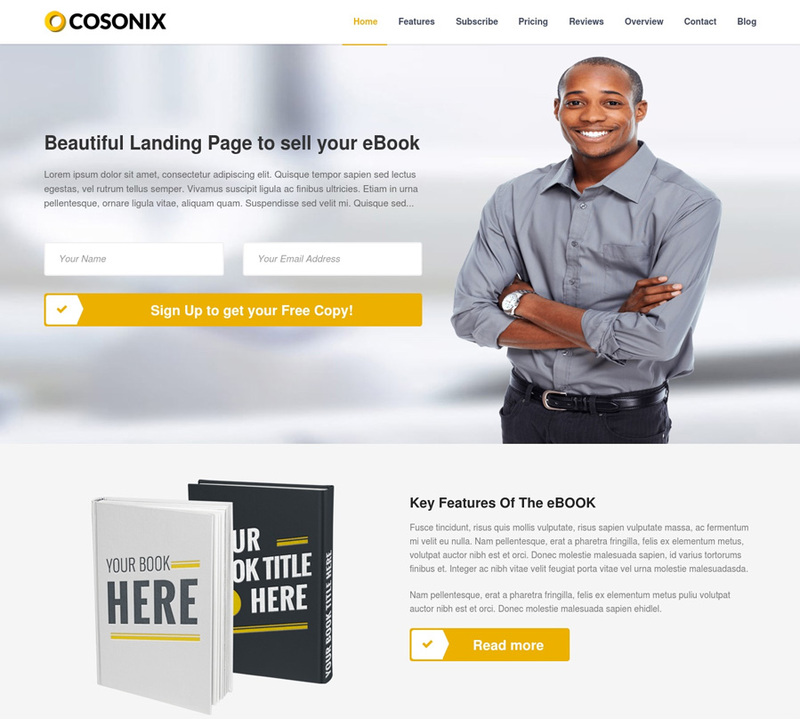 The importance of a well-designed landing page to sell the eBooks can never be overlooked. The Publisher theme was born to help Writers, Authors, and Publishers to promote and sell their books online quickly and easily. With it, you can not only showcase your eBooks and other digital products but also sell them. This theme’s homepage is composed of a number of widgets. You can swap elements around to match the requirements for your online store. Sell eBooks, books or any other products. Publisher comes with our very own Digital Downloads plugin. It lets you sell digital goods straight off your site. It’s a plugin that will enable cool product-selling features on your site. In addition, It offers to sell aspects with WooCommerce and tons of visual appeal add-ons, You can use this publisher website script to sell stuff online. It’s made with a responsive layout that offers tons of pre-built elements. Publisher is fully customizable with unlimited choices for colors and 600+ google fonts in the Theme options panel for page headings, backgrounds, and sidebars. This theme is easy to customize and WPML plugin fully supports so your content will be easily-translatable. You can use the included coupon module in this website template for authors to offer discounts. So sell eBooks or products at a discount. Discounts can be fixed-amount based or percentage based. Moreover, Publisher is SEO-ready, as it aims to increase organic traffic from Google search. BookGuide is a well-designed eCommerce ready theme with wooCommerce that you can absolutely use for publishing your personal or company portfolio, showcasing your multiple or single products or building an efficient online store for your business. BookGuide meets all for a Online book store requirements. Be it your need selling physical products or ebooks, BookGuide comes as a perfect solution. This theme is very flexible and packed with options that make website development an easy task. BookGuide is extremely reliable, built on a solid foundation of W3C valid HTML5 code styled smoothly through advanced CSS3 scripting technology and a modular Bootstrap design that is inherently mobile and developer friendly. It comes with multiple homepage layouts and different trending colours. BookGuide includes Mega Menu for its page organization and Visual Composer plugin that allows you to build advanced layouts for your posts, pages and the homepage of your site using a drag and drop back and front end editors. It also includes a Slider Revolution premium plugin to help people generate striking slideshows for your content, products and images an easy job. Try BookGuide now! 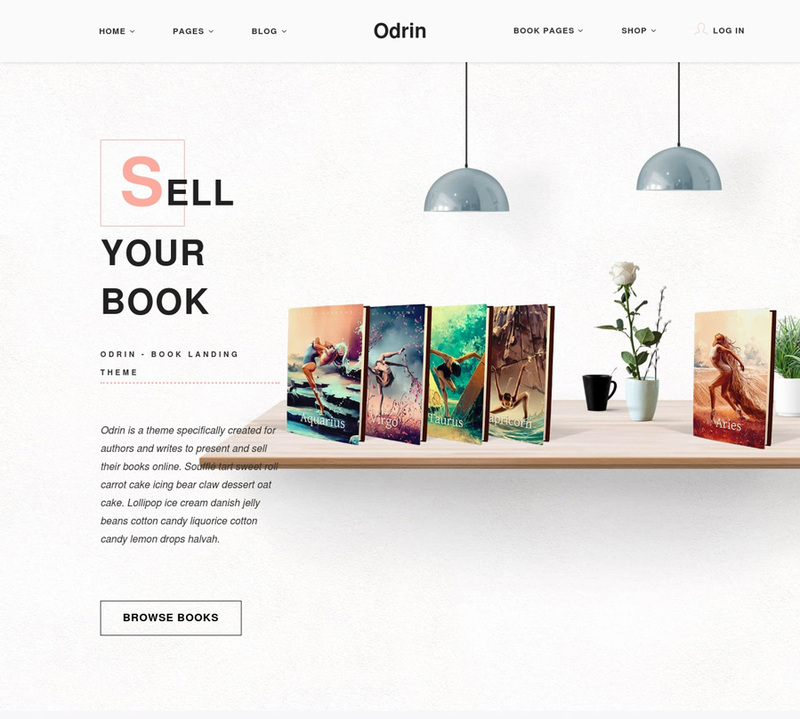 If you want to create an excellent website that is dedicated to selling your eBooks, Odrin can be your greatest ally. 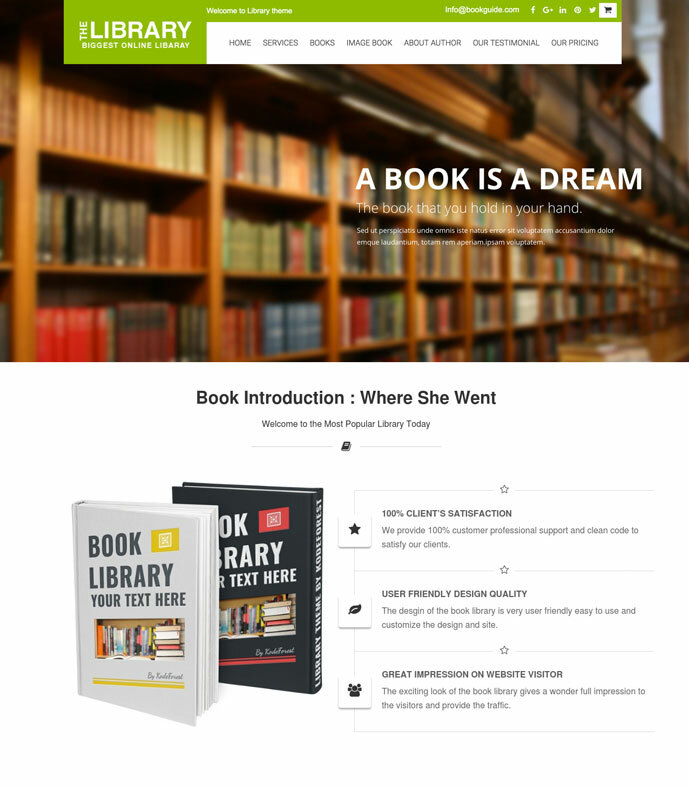 Odrin Book Selling WordPress Theme is a well-designed for Writers and Authors to selling them products online. With built-in commercial capabilities powered by WooCommerce, selling eBook becomes easier than ever. Odrin uses a clean code and HTML5 and CSS3 files and based on Bootstrap Framework for a great performance with appealing looks. With an elegant page flipping effect and many shortcodes and prebuild templates specifically created toward book writers and authors, it’s the perfect presenting your book. WooCommerce integration out of the box saves you tons of time and trouble and lets you easily market your book, eBook or packages within minutes of the one-click installation process, with PayPal or Stripe payments integrated from the start, online payment is simple without much coding skills. 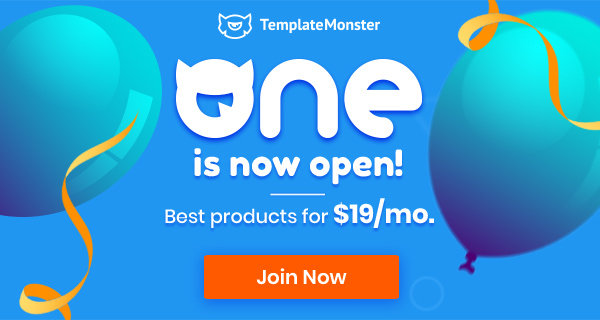 It is built to support an SEO friendly platform, powerful admin panel, translation and multilingual ready to make your website easily accessible for everyone around the world. 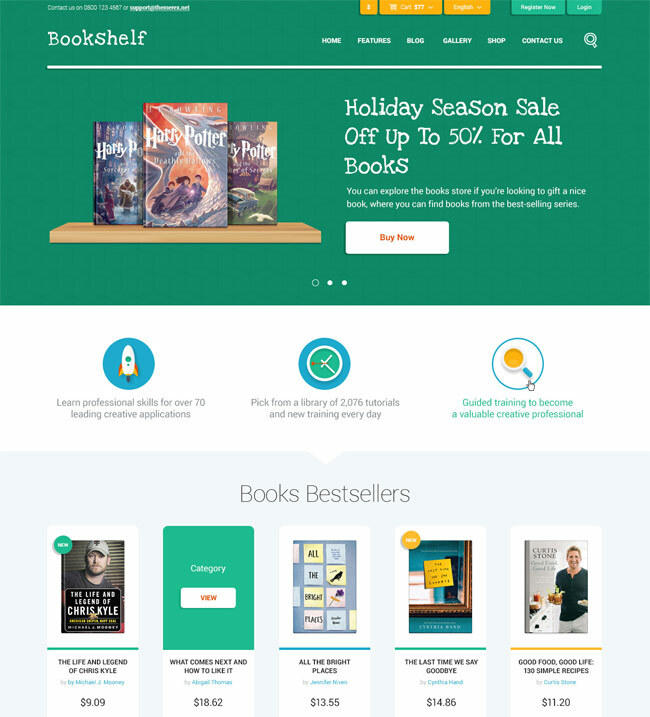 Booker is a fully responsive, modern and flat design WordPress theme suitable for authors and marketers can selling books online, a theme dedicated to promoting and selling your ebooks. It is feature-rich and carefully designed to help you quickly create a landing age for your books. Booker is a beautiful and powerful WordPress theme, it comes with premium plugins like the Visual Composer for intuitive advanced layout edition as well as the Revolution Slider to create magnificent sliders that will ravish and delight your audience every time. Showcasing your book in a quality and custom style is easy with Booker, the theme is optimised for Downloads, Overview and Samples, Reviews and an Author Bio’s. Best of all with our page builder you can make any layout possible, Booker really is simply a pleasure to use. Booker is prepared out of the box to function as an online store for your digital books, eBooks or even printed media, with sophisticated features like a Highlight reel with daily highlights as well as special deals, gorgeous post stylings, native WooCommerce integration in a number of customized trims, and utter responsiveness across the spectrum of devices and platforms. FlatBook was built to be as easy to use as it can be, so it doesn’t matter what level your experience is, FlatBook will provide the perfect solution to make your ebook or book landing page stand out from the crowd! FlatBook comes with a live theme customizer with more than 100+ Customizer Options included, what gives you the ability to modify the layout, typography, color and many other settings instantly – without need for refreshing the site – what makes the theme customization process quick, fun and easy. FlatBook comes with a handy Page Builder template, which gives you the ability to have as many one-page builder pages as you need – within the same website. It features 6 Header Layouts, 13 Content Sections & 3 Footer Layouts to choose from. The Avatar is a unique and modern WordPress theme that is suitable for App Landing Page, E-Book selling… The Unique Style is getting more popular, so show yourself from the best side! The theme has an incredibly minimal but very impressive layout. 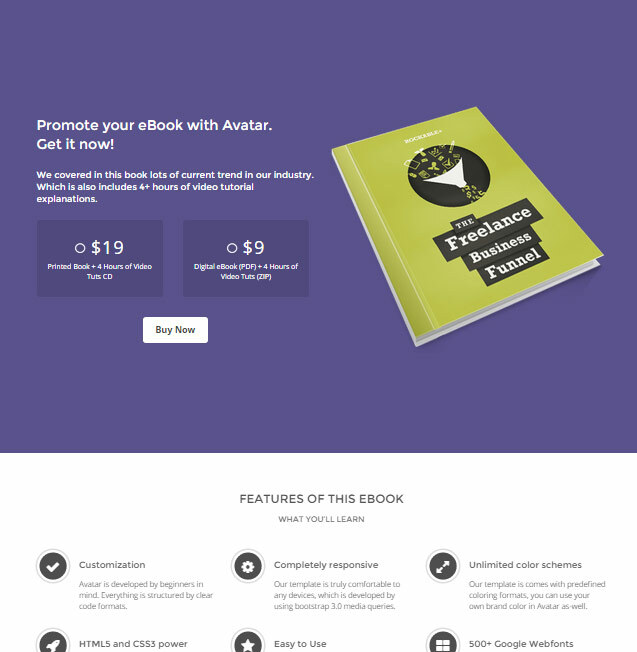 Perfect place to choose a better ebook selling WordPress theme. I have been searching for the same and here my search is over. Really an amazing collection of WordPress themes you have shared. It’s great that we have found the newest WordPress themes 2017 help for authors can selling their eBooks and included in this articles. You can explore all themes again.